Magic - KISS Kronicles 1973 To 1983 is a book that provides a day by day account of KISS’ first ten years. Photo sessions, recording sessions, rehearsals, concerts, interviews, TV appearances, band/management meetings, record company meetings, band member travels and other personal activities will all be chronicled in unprecedented detail. This information has been researched and compiled from a variety of sources including all printed material on KISS from the past 42 years (books, magazines, newspapers, fanzines), official Aucoin management paperwork, official Casablanca paperwork, official recording studio log books, hundreds of audio and video interviews, as well as new interviews with photographers, roadies, record executives, costume designers and fans. No other KISS book has ever gathered this much information and organized it in a precise timeline. Every day, every verifiable fact, every KISS fan's dream. Magic will also present an extensive and complete study of KISS makeup, costumes, jewelry, hair styles, musical equipment and stage designs. From the clubs to Creatures, drums to dragon boots, stars to guitars, each variation of KISS' visual impact will be explained in exhaustive detail. Magic will be VERY photo intensive with over 300 rare, never before published images from professional and amateur photographers alike. There will be a story and detailed information to accompany each photo. Please understand, each image will be carefully chosen for MAXIMUM impact. The book itself will be 500 pages, full color, glossy finish, hard cover, 9x12" and stunning. It will be published by Christmas 2015. Hundreds of newly discovered facts and details will be revealed, myths will be explained and mysteries will be solved. I am absolutely committed to making this book the most honest and detailed KISS book ever. Just to be clear, this book will definitely not focus on the dirt. It will be strictly a reference book for who, what, where, when, why and how with as many rare, gorgeously sick photos as I can possibly fit into it. 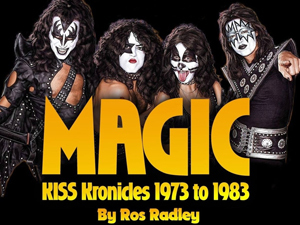 Magic - KISS Kronicles 1973 To 1983 promises to be THE definitive story of KISS’s original make up period – the Magic years from 1973 to 1983. You can check out sample pages right HERE.